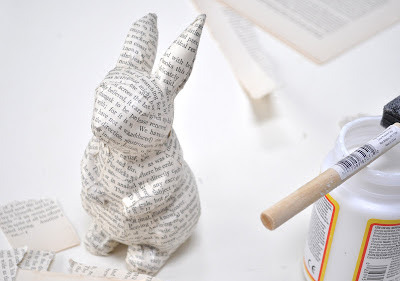 Since my book page Christmas tree was a big hit in blogland, I decided to try a book page bunny for Easter. I searched the net for book page bunnies and although there were a lot of decoupaged bunnies, there were not too many decoupaged with book pages. There was this bunny with tutorial from Little Birdie Secrets. 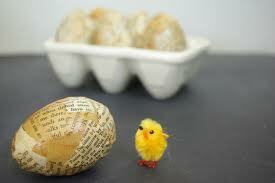 And then there were these book page eggs that interested me from Oleander and Palm. I liked the idea here of several shades of book page color and print sizes. Maybe a little more vintage looking. Then I ripped up small pieces of book pages prior to gluing. I think I ended up ripping some pieces even smaller, but you can see the variation in type size and page color. I started brushing on Mod Podge with a small foam brush but really ended up applying a lot of the Mod Podge with my finger. It took me several hours to finish as I used pretty small pieces of paper. Then when I woke up this morning and checked on my project some of the bright blue was peeking through in spots. I added more Mod Podge and more paper pieces. I really like the way my bunny turned out. He has a crazy quilt kinda vintage quality! I put my bunny in an Easter vignette with one of my styrofoam button Easter eggs in a zinc pot with Spanish moss. If you want to try your hand at the button eggs, my post is here. Old Bibles in a wire basket. I added a vintage framed Easter card that was my Grandma's. Stay tuned for my chocolate bunnies to come soon! Adorable. I have done the eggs, but I will have to watch for a bunny! Great ideas, love your bunny and the button egg! Charlene, you have such amazing vision. Beautiful vignette! He's cute and a definite improvement over his shiny electric blue orginal state! That is the cutest bunny I've ever seen! So sweet, love this!! Love the entire vignette Carlene. That card is precious and your bible collection is wonderful too. You have been so busy. Chomping here to do a little creating. My SIL have Weds. set aside this week to create for at least 3 hrs. I really like your projects Carlene. Love the bunny and the egg!! I want to make me a bunny like yours...going to check the dollar store and our local craft supply store to see what I can find. Thanks for sharing. I never thought of this! Thank you for the inspiration! I love the bunny, the egg and your vignette Carlene! I may have to borrow this paper idea at some point ;-) Thanks for sharing it at my party this week! I love the Bibles in the wire basket and your covered bunny is so much nicer than the shiny blue. Bunny looks vintage! 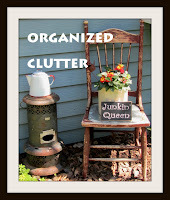 Such a fun and cute idea Carlene! Thanks for sharing! Geeze Carlene...I would have never envisioned that fun project when I saw that frighteningly aqua blue metallic bunny!! I do love it when you do a craft girl! So awesome! And the button eggs are really cute! This is one great looking project! You made "cheesy" look high end - wow! Hope you can stop by the enchanted oven to say hi. This bunny looked so familiar to me. I looked at mine and it is exactly the same, but it's ceramic with a crackle finish that I just added a ruffled burlap collar. Love how you did yours. I too have one done in music sheets. Love the button egg. Love your bunny and your blog! I'm a new follower. I'd love it if you would share this at "What We Accomplished Wednesday," at Green Willow Pond. It is live right now. Have a great week! Just love your little bunny. I'm stopping over from Kim's.